Lily Barry (Hermon, Maine and McKell Barnes (Durham, Maine) hit back-to-back home runs in the sixth inning and Emma Vaillancourt (Saco, Maine) out-dueled Taylor Lively (Greenfield, Mass.) 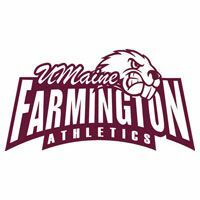 in the pitching circle as fifth-seeded University of Maine-Farmington defeated fourth-seeded Castleton State College 3-1 in North Atlantic Conference (NAC) softball quarterfinal action. Lively toted a 1-0 lead into the sixth inning, and quickly retired the first two batters she faced. But, with two outs Barry and Barnes went back-to-back to give the Beavers a 2-1 lead. Kaitlyn Barlett (Chesterville, Maine) followed with a ringing double down the left field line and Shannon Mitchell (Portsmouth, N.H.) traded places with her after a double to the left-centerfield gap to make it 3-1. A lead-off double by Mercedes Maltbie (Warrensburg, N.Y.) breathed life into the Castleton dugout, but Vaillancourt quickly snuffed out any thoughts of a rally, inducing a pair of pop-outs and finishing the inning off with a strikeout. Castleton was able to put the lead-off batter on base again in the seventh on a single by Julie Benzenberg (Pine Bush, N.Y.), but Vaillancourt got pinch-hitter Bridget Dusha (Greenwich, N.Y.) to ground into a double play, and Hannah Greene (Rutland, Vt.) to foul out to end the game. The Spartans took the lead in the fourth inning when Tori Fearon (Colchester, Conn.) led off with a double to right-centerfield, moved to third on a wild pitch and came around to score on a Sarah Flore (Springfield, Vt.) sacrifice fly to left. Vaillancourt was outstanding in the win, striking out 11 in the complete-game win, scattering four hits and walking two. Lively came out on the short end of the duel, allowing three earned on six hits and nine strike outs with no walks. Farmington improves to 10-17 on the season and advances to take on top-seeded Husson on Friday at 10 a.m. The Spartans end their season at 16-19.